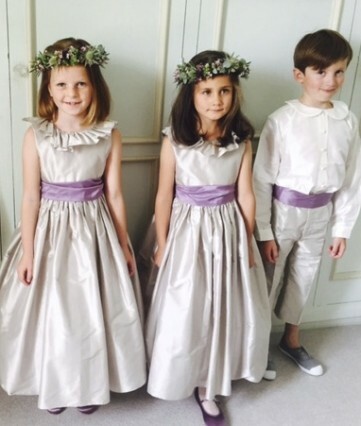 Nicki and Charlotte attended a family wedding last weekend and the flower girls and page boys were, as you would expect, suitably attired in their Nicki Macfarlane creations! The two girls (including Nicki’s grand daughter, Grace) looked absolutely beautiful in our Mirabelle dress from the Cygnet Collection. They were made in sumptuous silver silk with a contrasting violet silk sash. The matching violet Abigail shoes and a stunning floral crown, finished the look off to perfection. The boys meanwhile, looked extremely handsome in their silver silk 3/4 length trousers, a violet silk cummerbund and our silk Peter Pan collared shirt – very smart! If you are planning the colour scheme for the young attendants at your wedding, we do recommend using contrasting coloured silks to pick out the colours of the older bridesmaid dresses or the flowers in your bouquet. Silver and gold for example are wonderful base colours to consider,as they add a wonderful, regal, luxurious touch to any special occasion. If you would like to discuss your colour scheme or receive fabric swatches from our extensive range of silks, please contact charlotte@nickimacfarlane.com or call us on 01580 213655.